Where does Prowler Pro get its quiet work ethic? Look no further than the American factory it was born in. And the legacy of Textron vehicles that stand behind it. 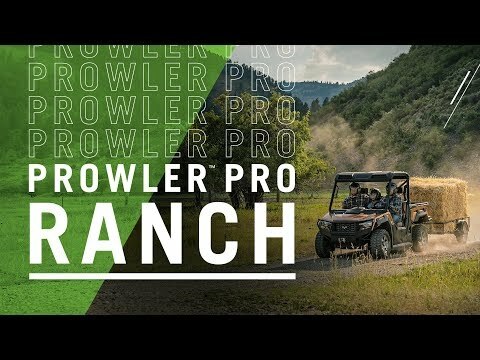 With a whisper-quiet, 50HP engine, plenty of storage space and more than 50 custom and easy-to-install accessories, Prowler Pro is ready to dig in — whether you’re on the clock or on the hunt. NOISE-REDUCING DESIGN: We built every inch of Prowler Pro to start quiet, and stay quiet. Whisper-quiet 50 hp gas engine with 812 cc, sound-dampening intake design, rear-mounted engine to reduce noise and vibration, vibration-reducing frame, precision-tuned exhaust system. SOUND-DAMPENING INTAKE DESIGN: Made to keep your ride quiet. REAR-MOUNTED ENGINE TO REDUCE NOISE AND VIBRATION: Positioned in the rear of the vehicle to lower unwanted noise. PRECISION-TUNED EXHAUST SYSTEM: Eliminates abrasive exhaust tones. WORK-READY: 2,000-lb towing capacity, 1,500-lb payload capacity, 1,000-lb capacity cargo box with tilt, 6-passenger bench seating, column shifting adjustable driver seat, easy to service and upgrade. 3-PERSON BENCH SEATING: Bring more passengers along for the ride. SIMPLE TO SERVICE: Easy access panels make vehicle maintenance quick and easy. 1,000-LB CAPACITY CARGO BOX WITH TILT: A truck-like bed makes it easy to load up, drop off and repeat. NEXT-LEVEL STORAGE: Prowler Pro was designed to help you carry everything you need for the road ahead, with plenty of built-in storage space. 17.95 cu-ft of storage, 14.72 cu-ft cargo box, customizable modular design, multiple in-cab storage compartments, removable passenger seats, spacious glove box, behind-the-seat storage. REMOVABLE PASSENGER SEATS: Both cushions detach easily to fit behind seat-backs for added storage and space. CUSTOMIZABLE MODULAR DESIGN: Additional accessories are quick and easy to install. BEHIND-THE-SEAT STORAGE: A dry and secure compartment for your gear. 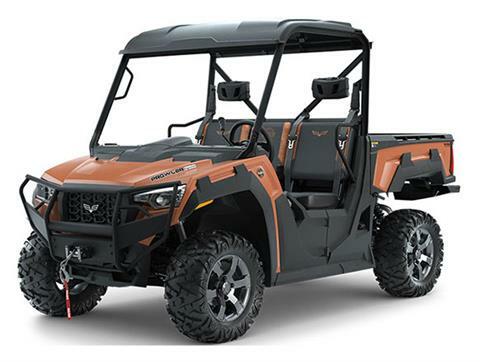 SUSPENSION & HANDLING: 10-inch front and 9.5-inch rear suspension travel, 10.75-inch ground clearance, 27-inch Maxxis Bighorn 2.0 Tires, selectable locking rear differential, electronically selectable 4WD. RELIABILITY: Robust 12-month warranty, made in Thief River Falls, MN; built with Textron precision engineering and aggressively tested for over 1,000 hours. INSTRUMENTATION: Digital Gauge, Digital Speedometer, Odometer, Techometer, Tripmeter, Gear Indicator, Fuel Gauge, AWD Indicator, Hi-Temp / Low-Battery Lights, DC Outlet, On-Board Diagnostics. 3-Point Seat Belts, Seat Belt Rev Limiter, Half Doors, Roll-Formed ROPS, Headlights, Brake Lights, Passenger Grab Handle, Customizable Speed Controller. Roof, 4,500 lb. WARN Winch, Front Brushguard, Rear Bumper. Storage - 14.72 cu. ft.